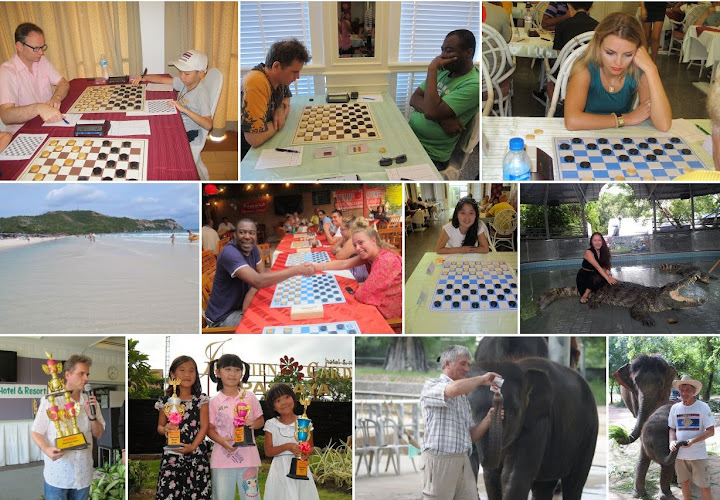 In May 2017 there will be the 13th Edition of the international draughts tournament THAILAND Open in Jomtien, a nice tourist village just at the beach. We will play 9 rounds in 9 days according to the Swiss System and the rules of the FMJD. Thailand Open is recognized by the FMJD and therefore there are standards for rating and international titles to earn. Time: 80 + 1', so for each player 80 minutes and 1 minute per move. The entrance fee of the participation is 55 euro. The inscription fee is 85 euro for players who didn't book by the organization for the playershotel, but are staying somewhere else in Thailand. If you stay in the playershotel where the tournament is held, the costs are app. 199 euro for 9 nights with breakfast, based on a shared room. Excursions are, of course, not included in the price. We recommend you to spend more days in the nice country of Thailand. Come and join the 13th International Draughts Tournament in Jomtien (‘Thailand Open’) 26 May – 4 June 2017 in the Jomtien Garden Hotel, 31/71 Moo 12, Nongprue, Banglamoung, Chonburi 20260, THAILAND. 31 May: FREE DAY. Full day excursion (if you like). You can choose if you want to play the Open Blitz- and Rapid championships or not. If you don’t play one of these championships, you will have more free time. There are many prizes (at least 50 prices, devided in money (> €2.500 and cups) in several categories. It depends on the number of participants. Thailand Open 2017 is sponsored by Tulip House, Jomtien Garden hotel, NRG-events, Hoofdlijn, Mindsports4you, Restaurant "Ons Moeder" Pattaya, & Damatico Mindgames. We have more events on our program of Thailand Open 2017. If you want to join the 13th Thailand Open, and you have some more time, then you can also join our Dubai Roundtrip! Everyone can join this beautiful stop-overtour! Day 01, Friday, May, 19 Arrival in DUBAI. Day 04, Monday, May 22, DUBAI Day at leisure! Last edited by Andrew Tjon A Ong on Thu Dec 22, 2016 03:36, edited 3 times in total. Immediately after the Thailand Open event, we have a very nice trip to Cambodia which everyone can participate! After successful tours to Laos, Vietnam and Singapore & Malaysia in 2016, in 2017 we will visit the impressive Cambodia. The great diversity of culture and nature and the painful history makes Cambodia a fascinating country. This trip offers the best of Cambodia has to offer. We will picked up in our hotel in Jomtien, and the beautiful trip can start. We will visit the official Wonder of the World Angkor Wat. Then we will go to Battambang, the Capital Phnom Penh, the interesting Kep and Kampot, and at the end we will relax at the beautiful beach of Sihanoukville. After that we will travel back to Bangkok. End of an unforgettable holiday! We are very proud that we are the best thing that Cambodia has to offer in this one trip. It will be a great adventure, in which the participants only need to be there and enjoy. All this under very expert in Cambodia residing Dutch-and English-speaking tour guide. We will stay at all four star hotels, all featuring a swimming pool! Don't miss this unique opportunity! After breakfast you will be picked up by a tuk-tuk (the famous Asian tricycle consisting of a motorcycle and a cabin) and this will take you to one of the biggest and most beautiful temple complexes in the world: the official world wonder Angkor Wat! We will explore led by a guide. The world heritage temple dates from the 12th century and is a combination of mystical and beautiful images. First we will visit Angkor Wat itself bring and where we will walk through one of the most important temples of not less than 110 temples. Before we continue we will review our thirst with a soft drink or perhaps a fresh coconut? A short drive brings us to Angkor Thom, which includes, among others, the 12th century Bayon. The 54 four-headed Buddha statues are one of the most impressive sights of the temple complex. Later in the day we visit the Ta Phrom temple. This is one of the few temples in the original state is held. It was made famous by the film Tomb Raider, who has recorded with Angelina Jolie. The temple is partly overgrown with trees with huge roots, which are 'nested' and on the stone blocks. At five-thirty you will be picked up by tuk tuk for the dinner-dance show, the "Smile of Angkor". Prior to this show, you have a buffet dinner with a wide choice of Asian dishes. The show is of top quality. A combination of sound, light, lasers and dance make this interpretation of the birth of Angkor a breathtaking show. We take a whole day to explore the area of Siem Reap by bike, jeep and boat. While we're on the bike take the first part of the tour, we literally breathe the smell of the rice fields and we are surrounded by beautiful lotus fields. We stop at a local market, traditional houses and small hidden temple. An easy bike tour on flat roads for about an hour. For those who can not bring bikes, we arrange a moped or trolley which can be rode and which can be subsequently followed the same route. By jeep, we continue the route to Kampong Kleang, the biggest floating village in Cambodia. The most authentic village on the big lake. Because we use jeeps, we are going to be able to drive partly through the countryside to our destination. It's a great experience to be driven in a vintage jeep. No windows and doors in the jeep, so we scents and environment can include in our way possible.. During the dry season we can do between up to 10 meters high poles on which the houses are built by walking. In the rainy season the water in the lake to rise to 1 or 2 meters from the floor of the house and you understand why the houses are built so high. Lunch with a local family and we can relax here in hammocks. Then we go by boat to sail through this village . At a pagoda we learn about Buddhism and we will experience a special experience: We are blessed by a monk! A unique experience. The road goes back to Siem Reap for a part on dirt roads and through small villages. At the end of the afternoon we are back in Siem Reap again. time with the hand excavated and served as a water reservoir. Nowadays this basin is still used. Then we visit a silk farm Artisan d'Angkor. Locals here will have the opportunity to learn the craft of weaving, a craft that is present in Cambodia for hundreds of years. Optional. We can visit the Circus tonight Phare. A unique show even enjoys worldwide fame. Time for a first introduction to Battambang! Today, a ride on the famous bamboo train forms part of the route. This is probably the smallest train in the world and a unique local invention. The train consists of a bamboo-platform and two pairs of rail wheels and is driven by a small petrol engine. Because there is only a single railway line, the train must occasionally the rails are removed, to allow oncoming traffic, and sometimes they will go to the side of us. Time for an interesting city tour of Phnom Penh. In the morning tuk-tuks bring us to the S21 genocide museum Tuol Sleng. This former high school wed used by the Khmer Rouge as the most notorious S21- prison during their regime that lasted from 1975 to 1979. Then it's just a short drive to the Royal Palace, a building complex that serves as a royal residence for the king of Cambodia. Here we can see pure Khmer architecture. We continue on this city tour by leaving the city and visit the lurid Choeung Ek, better known as The Killing Fields, where thousands of people were tortured and buried in mass graves. On the way back to the hotel we stop at one of the local markets. After breakfast we be picked up at the hotel by our driver. Today we drive towards the coast. Cambodia is located on the Gulf of Thailand and next to some very nice beaches also again many times fewer tourists on the beaches. This will experience later in Sihanoukville. First we go to Kep. Today we visit the famous Kampot pepper plantation. The best peppers in the world hail from Kampot. We learn all about red, white and black peppers that enjoy worldwide fame. Today a boat tour on the program. Diving from the boat and swimming in a turquoise bay with a beautiful white sand beach make this day one to never forget. - Visit to the "bat army"
- Boat tour mangrove, mangrove planting, donation to the project. - Daily bottled water during the tour and on the bus. - Entrance fees and meals (10 lunches (L) and 8 dinners (D) according program total to be paid on the spot 125 euros. - Personal expenses, other meals (1 dinner Phnom Penh and Sihanoukville 2 dinners), insurance, visa, drinks and optional excursions. To increase the ease during the trip, the entrance fees, lunches and dinners in advance paid at once (€ 125), so having to settle participants not separately for each excursion or meal. This increases the comfort while traveling and also provides a lower price, because it reserved by the tour operator and paid. Your passport must be valid for at least six months after departure from Thailand. Visa for Thailand is not necessary. The aircraft must be filled in a note which one gets a visa stamp in their passport on arrival. Need more information?? Everyone can join this tour!! The route is in the pink line indicated. 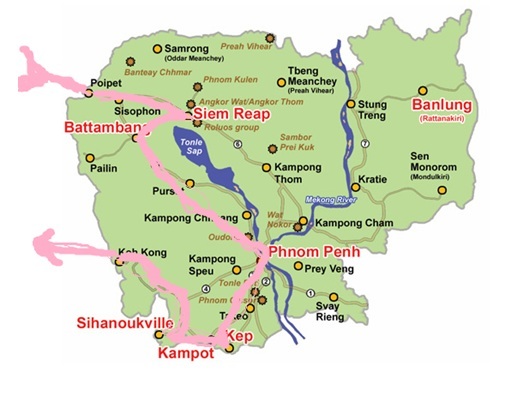 Route Siem Reap, Battambang, Phnom Penh, Kampot, Sihanoukville, Bangkok. Time for an update of Thailand Open 2017. It goes well with Thailand Open. We already have lots of participants for the tournament and the tour to Dubai and Cambodia. Now is the best time for Registration! We already more than 40 participants from all over the world. Make sure you also add! Don't miss this tournament! After four weeks, the 13th Thailand Open will start. You can still join this tournament, and also you can join the Dubai tour (5 days) and the very interesting 12-days Cambodia-tour. Hiroshi Kawaguchi from Japan versus Bas Baksoellah from Holland, will also join the Thailand Open 2017 again! Prizewinner Nattawut Upiri from Thailand will also join the 13th Thailand Open again! The winners of the Women-catergory, with Anna Chuprova (Russia), Nathalia Shestakova (Russia) champion and Nona Savina (Russia) 3rd.